Obituary – Jerome, June Evelyn (Kennedy) « Perry High School Alumni Association, Inc.
– daughter of Mr. and Mrs. Kennedy, was born June 24, 1918, in Tulsa, Oklahoma. She has attended school in Perry. While a student in Perry she has been a band and orchestra member. She has played basketball, played in Civic Orchestra, Girls Glee Club member, and played in the All State Girls Band Concert in Chickasha, Oklahoma. Miss Kennedy is interested in Physical education work and beauty work. She expects to enter college in Stillwater or Ponca City. 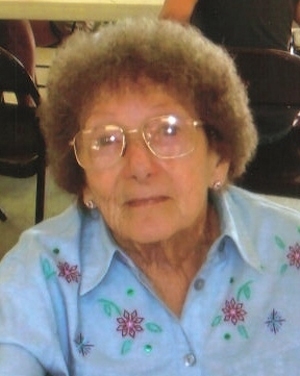 June E. Jerome passed away on Nov. 29, 2010 at her home in Colorado Springs, Colorado. She was born June 24, 1918 to Ivan & Hazel (Eby) Kennedy. June grew up in Perry, and graduated from “Dear Ole Perry High School” where she was the first female trombonist in the state of Oklahoma. She married Sam K. Jerome on March 24, 1940 at Pawnee Okla; preceded in death by her parents Ivan and Hazel Kennedy; two sisters, Carol Plesinger, and Margie Talbot; her brother, Bob Kennedy and her husband Sammie Jerome. She leaves three sisters; Donna Golliver, Betty Anderson, and Warenne Harris. Children: Margie McDonald of Colorado Springs and Ken Jerome of Little Rock, Ark; six grandchildren; seventeen great-grand-children, and eight great-great grandchildren. She will be buried next to her late husband in Grace Hill Cemetery in Perry.